Don't send your other to jail: Get your concealed handgun licenses together! O.K. Now you've made up your mind, and you're going to go get the training you need to apply for a permit to carry. If you have talked to some of the othe people who are offering classes and training, chances are they did not mention the most important person in your life. That person is your spouse, your spouse-to-be in a coming wedding, your significant other, or just a close companion living in the same house with you. Harry has gotten his permit to carry. Wife Mary did not bother, since she is not really interested in guns and doesn't really care much about shooting or carrying a firearm. It's Saturday afternoon. Harry is trying to bring life back into the old riding mower in the garage. True to form, Harry needs a carburetor rebuild kit and a spark plug for the mower. Easy to handle. Just jump in the old pick up and run down to the local hardware store and get what he needs. Harry gets to the hardware store and takes his .357 snubby off of his belt, puts it in the console of the truck and goes in to get his parts. A few lawn mower jokes and a hunting story later Harry comes out jumps back in the truck and goes home. He pulls in the drive way and grabs his $50 bag of parts and heads back to the garage thinking, "Man, this darn mower is costing me more and more every year." He totally forgets about the .357 snubby in the console and goes back to work on the stubborn carburetor. Meanwhile, Mary is in the kitchen baking brownies for their son's T-Ball meeting later this afternoon. Just like always, Mary opens the cupboard, only to find that little Timmy has eaten the last of the chocolate chips she uses in her brownies. "Oh well, I'll just run to the store and pick up a couple bags." No real problem so far. Mary goes out the door to find that Harry's pick-up truck is blocking her car in the drive way. "Oh well, the keys are in the truck, so I'll just take it to the store. It will take Harry twenty minutes to come move it." Mary jumps in the truck and heads for the local corner super market. She get to the end of the street and, being in a bit of a hurry, she makes one of those California rolling stops at the intersection. Sitting down the street is Officer Sideburns, who is whitling away Saturday afternoon wishing he had the day off rather than sitting here watching sunshine. Sideburns jumps back, draws his weapon and hollers, "OUT OF THE TRUCK! OUT OF THE TRUCK! PUT YOUR HANDS ON THE HOOD AND DON'T MOVE!" Well, the rest is right out of COPS on TV. Mary is handcuffed and transported to headquarters, the truck is towed and the S&W .357 is confiscated. Mary is booked and charged with "Carrying A Concealed Weapon." Bond is anywhere from $1,000 to $5,000 dollars. The initial out lay is $100 to $500 dollars to get her released, pending a court date on Monday. Needless to say, Mary is not happy right now, Harry is not happy right now, and most likely he will sleep in the garage with the still-not-started lawn mower tonight. For Monday's court appearance, Mary must retain a lawyer to represent her. Harry will have to miss a day of work, and most likely both of them are going to make the local news media, which never pass up a good gun story. This incident can cost as much as $5,000 and up. The end of this story can go two ways depending on the judge who is sitting on the bench. He can use some common-sense judgment, some discretion and consideration, and dismiss the charges as an honest mistake. If by chance he is an anti-gun, anti-concealed carry judge, he can hand down up to a five-year prison sentence and $5,000 dollar fine plus probation time. Mary will be a convicted felon and may never own, purchase, possess or use a firearm. The same can apply to Harry's possession of firearms, unless he divorces his wife and goes to live in a different location, since Mary may not be in the same house with firearms. Every person who is married or who has a companion living in the same house, or who may by chance use their vehicle on a regular basis, should make it a point to see to it that both parties have their permit to carry. If you are going to take training for a license, do it together. 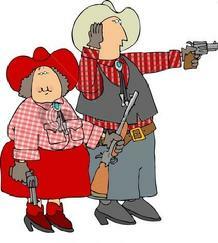 A spouse in the home with a permit to carry is just like a good insurance policy. Better to have it and not need it than to need it and not have it. Borrowing a statement from the Weather Channel, all I can say is, "IT CAN HAPPEN TO YOU."